Jul.2001 -- Jul.2003: postdoctoral fellow program in Operational Research and Control Theory, Academy of Mathematics and Systems Sciences, Chinese Academy of Sciences, Beijing, China. The major research field: portfolio selections. 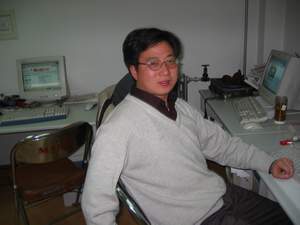 Sep.1996 -- Dec.2000: graduate student of the Ph.D. program in Computational Mathematics, School of Science, Xi’an Jiaotong University, Xi’an, China. Received Ph.D. in December 2000. The major research field: nonlinear programming approach. Sep.1991 -- Jun.1994: graduate student of the MSc program in Applied Mathematics, Dept. of Mathematics, Xi’an Jiaotong University, Xi’an, China. Received MSc in June 1994. The major research field: Mathematics of Economics and Managements. Sep.1987 -- Jul.1991: undergraduate student in the program of Mathematics, Department of Mathematics at Xinyang Normal University, Xinyang, China. Received BSc in July 1991. In addition, I have also trained in the following research fields after 1994, such as: Supply Chain Management, Quality function deployment, Data Envelopment Analysis, etc. I’m interested in economics, financial and management, and I have obtained rich knowledge in these fields. Jun.1994 -- Jul.2001: Lecturer in Department of Applied Mathematics, School of Science, Xi’an Jiaotong University, Xi’an, China. I have given the lectures of Advanced Mathematics, Linear Algebra, Optimization and Control Theory, Complex Analysis and Integral Transformation, Microeconomics, etc. to graduate and undergraduate students. Shou Jilin, Li Fei, Point weighted core and coritivity of network system and its applications, Systems Engineering Theory and Practice, vol. 16 No.6 (1996), 58~63. Li Fei, Xu Chengxian, Using linear programming to deal with the dependence between Engineering design requirements, Systems Engineering Theory and Practice, vol.20 No.7 (2000), 27~30. Liang Ximing, Li fei, Xu Chengxian, A hybrid method for solving variational inequality problems, Appl. Math. J. Chinese Univ. Ser. B. Vol. 15, No. 4(2000), 459~451. Li Fei, Mei Liquan, Shen Peiping, The coupling method of spectral and finite element method for transport equation and its application in nuclear industry, J. of Henan Normal University (Natural Science), vol.27 No. 2(1999), 13~15. Li Fei, Mei Liquan, The coupling method of spectral and discontinuous streamline diffusion method for transport equation, Mathematica applicata, vol.12 No. 4(1999), 15~20. Yang Shouzhi, Li Fei, Wu Kecheng, Biorthogonal wavelets fractional filter, J. of Zhengzhou University (Natural Science), vol. 32 No. 1(2000),16~18. Li Fei, Xu Chengxian, A quick-convergent method for solving strongly monotone variational inequality problems, J. of Zhengzhou University (Natural Science), vol. 33 No. 1(2001), 10~14. Li Fei, Liang Ximing, Xu Chengxian, continuation-type Newton method for solving the monotone variational inequality problems, J, of Engineering mathematics, vol. 18 No. 3(2001), 1~5. Liang Ximing, Li Fei, A class of iterative methods for solving monotone variational inequality problems, Mathematic Numerica Sinica, vol. 23 No. 2(2001), 155~162. Li Fei, Xu Chengxian, Sensitivity analysis for parameterized variational inequality problems, submitted to Journal of Systems Science and Complexity. Li Fei, A interactive goal programming approach to portfolio rebalancing problems, submitted to Management Science.